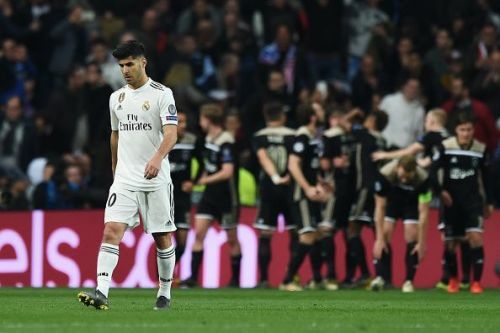 Ajax's stunning 4-1 win over Real Madrid at the Bernabeu means the Eredivisie giants have knocked out Santiago Solari's men: to progress from a Champions League knockout fixture for the first time in 22 years. The emphatic nature of their second-leg turnaround, having trailed 2-1 from the first leg last month, has sent shockwaves across the footballing world. 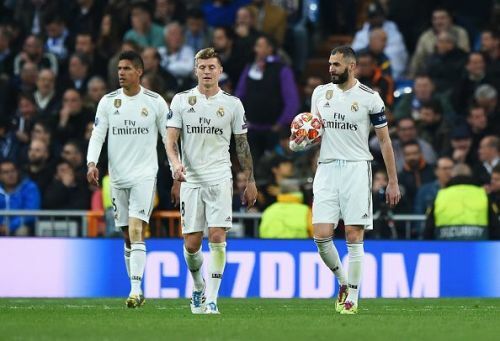 Real - who were UCL winners in four of the past five seasons - have declined significantly since the departures of talisman Cristiano Ronaldo and manager Zinedine Zidane last summer. Goals from Hakim Ziyech, David Neres, Lasse Schone and a Man of the Match display by former Southampton playmaker Dusan Tadic - who also got on the scoresheet - proved enough for Ajax to prevail, despite the hosts' best efforts of a surprise comeback. Substitute Marco Asensio reduced arrears with a smart one-touch finish from distance, after both Raphael Varane and fellow sub Gareth Bale hit the woodwork. After a defeat of such magnitude, there are questions aplenty asked of Real's long-term future following impressive continental dominance. Ajax, who were Europa League runners-up two years ago, have wowed neutrals and impressed among the best sides this term - which suggests they could be this season's Monaco and progress even further. Toni Kroos - Real's midfield conductor - struggled in a big way against an energetic Ajax side whose intensity proved too much to handle out of possession. His three key passes were only bettered by Tadic, the game's MOTM, but there wasn't much else to shout about from the German's performance. For Ajax's opener, he crucially relinquishes possession in his own half. Under pressure from Ziyech tracking down his side, he attempts a backpass but instead, it has the opposite effect: allowing both Ziyech and Tadic to advance forward on the counter-attack. If you watch Neres' goal again, you will see Kroos ambling back in the build-up. Instead of helping to press Tadic, he's jogging back at a relatively slow pace and simply watches as his teammates get torn apart. He's not the quickest but if he had put more effort in to cover the ground quickly, there's a chance that opportunity is snuffed out before the pass is played into Neres' path to begin with. Ballon d'Or winner Luka Modric will get most of the post-match coverage and criticism for the way he was so easily outmanoeuvred by Barcelona-bound Frenkie de Jong and Ziyech at times, but the absence of his midfield partner was particularly telling during those instances. Kroos couldn't keep up. His passing statistics were not at their usual impressive numbers (81.7%) and despite a game-high 85 touches, the 29-year-old was unable to impose his quality on the game more regularly than he did - which was infrequently and in bursts.